Emerald Ash Borer -- Known as EAB, this tiny insect has been enormously destructive in states where it has been found. CREDIT MANDATORY -- Image by David Cappeart, Michigan State University. Image via Bugwood.org. The emerald ash borer, accidentally imported from Asia and confirmed in the U.S. in 2002, has been blamed for the deaths of tens of millions of trees in the United States and Canada. It has been confirmed in six Arkansas counties. These are: Clark, Columbia, Dallas, Hot Spring, Nevada and Ouachita. The proposed quarantine would include all hardwood firewood, all ash nursery stock and ash for both saw logs and pulpwood, mulch and compost. The area includes the six infested counties and 19 others as buffer zones: Ashley, Bradley, Calhoun, Cleveland, Drew, Garland, Grant, Hempstead, Howard, Jefferson, Lafayette, Lincoln, Little River, Miller, Montgomery, Pike, Saline, Sevier and Union counties. A decision on the proposed quarantine would be made Sept. 11 by the Arkansas State Plant Board. One option is to enact an emergency rule that would establish a quarantine that would last 120 days. This time period would allow the ASPB to initiate a process that includes public hearings on the issue. A task force with members from the Arkansas State Plant Board, USDA-APHIS-PPQ, Arkansas Forestry Commission, University of Arkansas Cooperative Extension Service, Arkansas Forestry Association, Arkansas State Parks, U.S. Army Corps of Engineers, Arkansas Association of Conservation Districts, and Natural Resources Conservation Service met Monday to discuss a possible quarantine. The insect, a mere half-inch long, has expanded its range by hundreds of miles since being discovered in southeastern Michigan. It has since been found in 27 states, including Arkansas. There was some good news to come from Monday’s meeting,said Tamara Walkingstick, associate director of the Arkansas Forest Resources Center. “Survey results were negative for all other counties including Pulaski, Mississippi and Independence where suspects or suspect ash tree damage was found” she said. Larval tunnels or galleries immediately under the bark of dying ash trees. Barry said if any of these signs of infestation appear, contact your county extension agent or email the Arkansas State Plant Board at EAB@aspb.ar.gov. 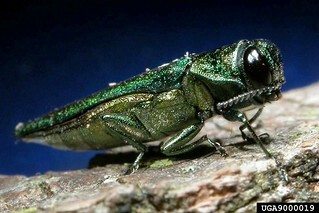 For more information about the emerald ash borer, visit www.emeraldashborer.info or www.arinvasives.org. A fact sheet about the borer may be found at: “Emerald Ash Borer: A potential pest of ash trees in Arkansas”, downloadable at www.uaex.edu/publications/pdf/FSA-7066.pdf.